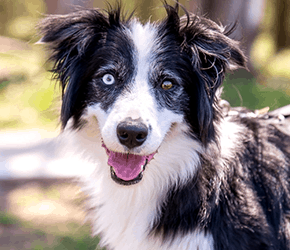 In June 2018, Animal Welfare League NSW Chief Inspector Sarah Stimson seized Jodi, a 3-year-old Border Collie after a person of interest attempted to surrender her at just 8.9kgs. Jodi was severely emaciated. Due to her long fur, it wasn’t evident how skinny Jodi was until Chief Inspector Sarah Stimson did a tape test revealing the severity of the situation. A vet evaluation showed that Jodi had a body condition of 5 out of 5 (1 is considered ideal). Jodi had no apparent muscle mass and no discernible body fat when examined upon arrival by AWL NSW Chief Veterinarian Dr Simone Maher. Jodi was also showing signs of mild hip dysplasia. Despite being only 3, Jodi has excessive graying on her face caused by her anxiety. Recently, AWL NSW prosecuted the defendant under the Prevention of Cruelty to Animals Act (1979). 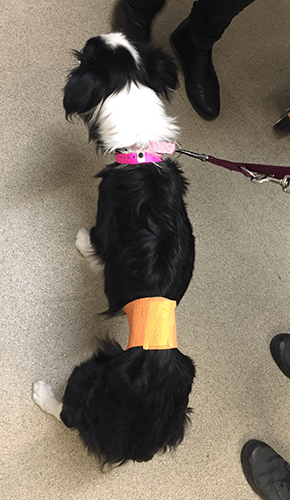 The defendant was found guilty and fined $375 for two offences (total of $750) for failing to provide proper and sufficient food to an animal and failing to exercise reasonable care of an animal. While at AWL NSW, Jodi has physically improved and is now at an ideal weight of 16kg. Jodi still exhibits signs of anxiety which is evident in Jodi’s excessive displays of spinning. Jodi has been under close veterinary monitoring and has been working with the AWL NSW behaviour team daily. Jodi may never fully recover. Jodi’s owner will. Receiving a mere $750 fine means Jodi’s owner can own another animal. Jodi’s story is sadly not uncommon here at AWL NSW. Every day, we receive animals into our care who urgently need help and we simply could not continue to help animals like Jodi without receiving donations from kind supporters. If you can, please donate today to help support the work of our Inspectors.